Align with what is most essential. The work I offer at Roots & Branches Bodyworks combines Western and Eastern techniques to address your specific concerns. I recognize and treat not just the dense physical body but also the energetic pathways or meridians to create a holistic approach to assist in both relaxation and rehabilitation. I would be honored to partner with you in your healing process. and Andrea Butje in Aromatherapy. I would feel honored to partner with you in your healing process. To speak to me and/or to make an appointment, call 518-524-5829. A Japanese style of body work performed clothed on a floor mat. It follows the same principles as acupuncture to help ward off illness and maintain good health. Stretching, joint mobilization and pressure applied with palms, fingers, elbows, and knees help to release areas of pain and tension or strengthen weakness and fatigue. Appropriate attire is loose clothing with long sleeves and legs. Many clients experience a sense of deep relaxation yet with a new feeling of energy. Operates on the theory that there are areas on the feet and hands that correspond to each organ, gland, and structure in the body. By working these areas, tension in the body can be reduced and balance restored. Encourages a more efficient working of the respiratory, digestive, lymphatic and energetic systems of the body. Many eastern cultures developed various styles of abdominal work in harmony with their belief that the ‘Hara’ is our energetic center. Chi Gong practices will be taught to enhance the effect of this treatment. This is the well known "relaxation" massage. Performed with oil, it consists of gliding strokes, compression, and kneading which improve circulation and muscular function. For more specific concerns pressure can be modified and acupressure techniques incorporated as well as appropriate essential oil applications. Steamy Wonder Add a 20 min. steam canopy treatment to your massage. This therapy helps the body to remove toxic waste, raise the metabolic rate and release muscular tension. Follow this with our signature massage for a wonderful bodywork experience. 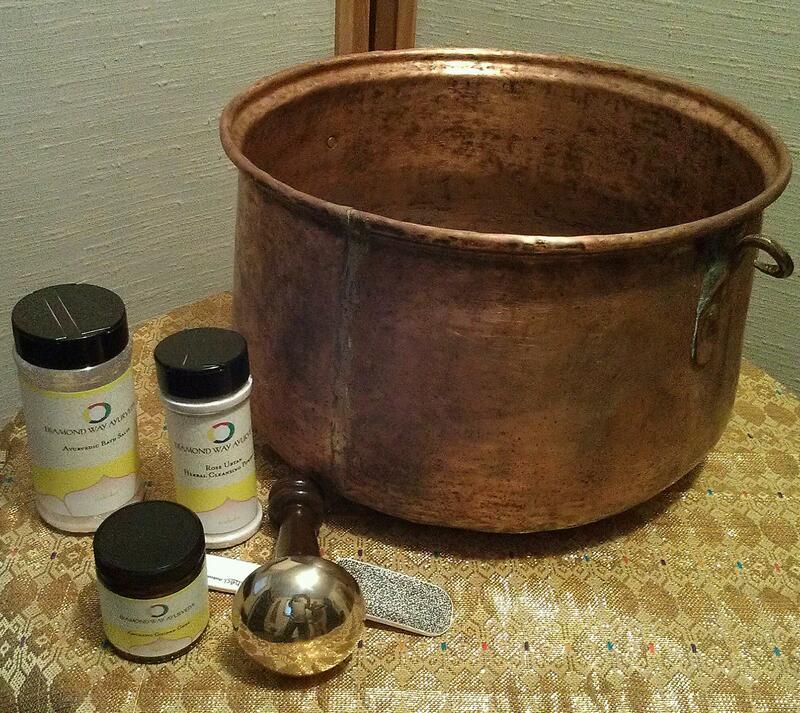 A relaxing, yet energizing treatment that includes a Himalayan salt foot bath, neck massage, Ayurvedic reflexology, a unique massage with the three-metal Kansa bowl, and finishes with gentle cleaning and exfoliation with an herbal powder. This treatment will lighten your step and brighten your mood. People are practicing detox diets. This is good, but often the body can not expel the toxins released. This combination is the answer. A three part treatment consisting of a vigorous massage with silk gloves to activate the lymphatic system, a warm sesame oil massage to increase muscle and joint flexibility, rejuvenate skin and keep impurities from accumulating in the body, and finishing with Swedana, an Ayurvedic steam treatment to raise the metabolism and drive out the toxins through a thorough sweat. The only treatment of its type that I know of locally. Countless words count less than the silent balance between yin and yang.